One reason naturopaths (NDs) are held in low regard is their historical opposition to immunization. Some naturopaths now claim that this opposition does not reflect the current view of NDs trained in accredited schools. However, a close look indicates that opposition is still widespread and that anti-vaccination views are deeply rooted within the educational system. The contemporary fashion of healing disease is that of serums, inoculations and vaccines, which, instead of being an improvement on the fake medicines of former ages are of no value in the cure of disease, but on the contrary introduce lesions into the human body of the most distressing and deadly import. . . .
To understand how revolting these products are, let us just refer to the vaccine matter which is supposed to be an efficient preventive of smallpox. Who would be fool enough to swallow the putrid pus and corruption scraped from the foulest sores of smallpox that has been implanted in the body of a calf? Even if any one would be fool enough to drink so atrocious a substance, its danger might be neutralized by the digestive juices of the intestinal tract. But it is a far greater danger to the organism when inoculated into the blood and tissues direct, where no digestive substances can possibly neutralize its poison . Lust's rant against vaccination was part of his more general disbelief that microorganisms cause disease, a fact that had been discovered by 19th century innovators such as Pasteur, Koch, and Lister. The fact that germs cause disease, which is commonly referred to as the germ theory, was probably the most important medical discovery every made and became the cornerstone of medical and public health efforts that ultimately saved billions of lives. It also refuted the naturopathic view that individuals brought disease upon themselves through their own bad behavior, which naturopaths refer to as the "real cause of the ailment." It would be interesting to know how Lust would regard the fact that vaccination has eradicated smallpox worldwide. A good case of smallpox may rid the system of more scrofulous, tubercular, syphilitic and other poisons than could otherwise be eliminated in a lifetime. Therefore, smallpox is certainly to be preferred to vaccination. The one means elimination of chronic disease, the other the making of it. . . . Naturopaths do not believe in artificial immunization . The Textbook of Natural Medicine, which is "modern" naturopathy's most authoritative book, was published in 1985 and revised in 1999, 2006, and 2012. [3-6]. The first edition contained a rabidly anti-immunization chapter called "Vaccinations and Immune Malfunction," written by Harold E. Buttram, M.D. The other three editions lack this chapter but still include the negative comments by Benedict Lust mentioned at the beginning of this article. The third edition of the Textbook is very strange. Its index does not mention vaccination or immunization, and the only mention I could find in the 2,200-page text was a statement that people in blood type A have more reactions to smallpox vaccination. The fourth edition lists vaccines recommended in pregnancy but states that "vaccination during pregnancy is a controversial topic in both conventional and natural medicine." The text also contains scattered comments about specific vaccines, some favorable, some not, but nothing that would encourage readers to advise parents or administer vaccines according to widely accepted public health guidelines. All four editions of the Textbook were co-edited by Joseph Pizzorno, N.D., naturopathy's leading educator, who founded and served for many years as president of Bastyr College of Naturopathic Medicine (later renamed Bastyr University). Pizzorno's 1996 book Total Wellness contains a 3-page attack on immunization that he says was mainly condensed from Buttram's chapter in the first edition of his Textbook. This section stated (a) the actual benefits of many vaccinations are probably not as good as advertised, (b) vaccinations induce a transient depression of immune dysfunction, (c) many problems linked to vaccinations have not been disclosed to the public . Pizzorno and his co-editor, Bastyr faculty member Michael Murray, N.D., also produced three editions of the Encyclopedia of Natural Medicine that published in 1990, 1998, and 2012 [8-10].None of these books recommended vaccination. The 1998 and 2012 editions expressed concern that immunization might cause children to develop asthma, even though large studies had shown no connection . An editorial states that many naturopaths with children will "at most" immunize them against polio and tetanus. It then explains that the "huge discrepancy" between established medical opinion and the actions of these "thoughtful" naturopaths is related to beliefs that natural methods can preserve and strengthen the immune system . Another article, written by a "research journalist" who is not a health professional, concludes: "A number of vaccines that are routinely given in infancy and childhood are promoted as safe and effective. Scientific findings, however, dispute these claims." The article even suggests that germs don't cause disease but merely seek and multiply in unhealthy tissues . Another article suggests that homeopathic products are safer and more effective than vaccination for preventing disease . The article's author (Michael Traub, N.D.) taught public health at the National College of Naturopathic Medicine and helped formulate the AANP's position papers on immunization and homeopathy. He recommends tetanus vaccine but advises against measles, mumps, rubella, and diphtheria. After paying homage to a homeopathic treatise on "vaccinosis" published more than 100 years ago, Traub's article details the use of homeopathic nosodes for preventing diphtheria, whooping cough, polio, influenza, tuberculosis, and pneumoccal pneumonia. Nosodes are products made by repeatedly diluting samples of pathological tissues, bacteria, fungi, ova, parasites, virus particles, yeast, disease products (such as pus), or excretions. The protocol Traub describes uses "200C potencies" which means that the nosodes are made by serially diluting the original substance 1-to-100 a total of 200 times. (After the 12th dilution, no molecule of original substance remains.) Traub states that he no longer recommends nosodes but uses other "preventive" homeopathic strategies. However, there is no scientific evidence that nosodes or any other homeopathic products are effective for any purpose. Nor will there ever be, because homeopathy has been refuted by the principles of chemistry, physics, pharmacology, and pathology . The American Association of Naturopathic Physicians' position paper on immunizations, which was adopted in 1991 and slightly amended in 2011, advocates "informed consent," "more research," and "parental choice." These may sound legitimate, but the real message is an unbalanced attack on immunization based on delusional philosophy rather than science. The prevailing scientific view is that a few minor problems exist and are being addressed, but the benefits of immunization are so much greater than the risks that immunization should be universal. (In other words, the public health value of immunization is so well established that it would be senseless to debate whether or not it is worthwhile.) In contrast, the AANP position statement exaggerates the risks and suggests that "some" of the current vaccinations are ineffective . In 2015, NUNM Press, the publishing arm of the National University of Naturopathic Medicine, published a book called Vaccination and Naturopathic Medicine: In Their Own Words. Spanning 400 pages, the book includes more than 50 essays by naturopaths, offbeat medical doctors, and other critics that were published between 1900 and 1923 plus recent essays that place the old writings in current perspective. The foreword, written by a prominent naturopathic educator, asserts that (a) the germ theory is questionable, (b) homeopathic vaccines are more effective than standard vaccines, and (c) naturopaths and homeopaths have long known that there are methods that confer immunity with no risk whatsoever . Surveys published since 2004 provide some indication of how naturopaths feel about immunization and how this affects their patients. More than 500 students at a naturopathic school in Canada were surveyed about their attitudes towards childhood vaccinations. Of those who responded, 12.8% were willing to advise full vaccination, 74.4% would advise only partial vaccination and 12.8% would not advise vaccination at al. Willingness to advise full vaccination decreased in students in later years of naturopathic training, and was associated with a high or moderate belief that vaccines are beneficial and a high or moderate level of trust in public health information. Lack of willingness to advise full vaccination was associated with a high or moderate belief that vaccines are risky, reliance on only "alternative" providers for vaccine-related information, and personal knowledge with someone with adverse vaccine reaction . An analysis of insurance claim data on 11,144 children in in Washington State (where Bastyr University is located) observed that children age one to two years who had ever seen a naturopathic physician were significantly less likely to have received vaccinations for the common vaccine-preventable childhood diseases and were even less likely if they received exclusive care from a naturopath. Based on a review of data on 213,884 children age one to seventeen, the same study found an increased likelihood of a history of a vaccine-preventable disease, most often chickenpox, among those who had ever consulted a naturopathic physician . A sampling at nine naturopathic offices in Ontario, Canada, included 129 patients with at least one child less than seventeen years of age. About half half reported full vaccination of all children, 26% stated they had at least one child who was partially vaccinated, and 23% stated they had at least one child who was completely unvaccinated . These vaccination rates were significantly lower than Canadian population averages. A 2014 survey sent to 505 naturopaths in Vermont and Oregon yielded 145 complete responses. Of these, 85 (59.9%) of the respondents said they commonly discussed vaccines, 32 said they sometimes discuss them, and 25 (17.6%) said they rarely or never discuss them. Although 81% agreed that "vaccines have an important to in preventing illness," 79% were [incorrectly] "concerned that a child's immune system could be negatively impacted by too many vaccinations." and 84.4% expressed concern about "the potential for long-term adverse effects." About half said [incorrectly] that in otherwise healthy children, it is better to develop immunity by getting sick than to get a vaccine. Even though homeopathic products don't work, 51% said that they can reduce adverse effects. Only 29.2% thought that parents of healthy children have an ethical responsibility to vaccinate their children to help protect other children who are unable to be vaccinated . Overall, the data show that although many of the respondents supported or partially supported vaccine use, the vast majority were not well-informed, harbored irrational fears, and were poorly equipped to give trustworthy advice about vaccinations. 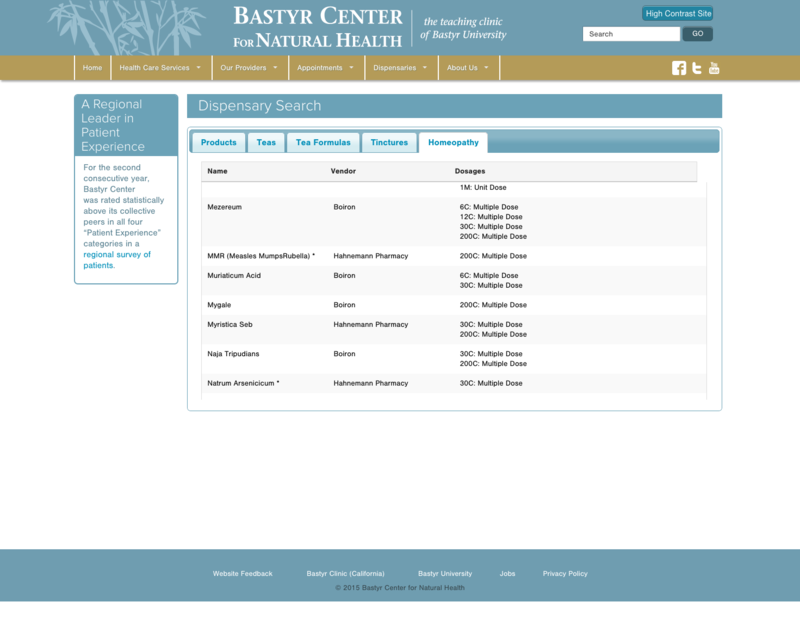 Former naturopath Britt Hermes notes that naturopathic teaching clinics and naturopaths in private practice offer nosodes instead of actual vaccinations .A Bastyr gradudate, she has reported that no immunization services were offered during her student days (2007-2011) and that when she called the clinic in 2015, she was told they were still not offered . Bastyr's teaching clinic dispensary still sells an MMR nosode. The Association of Accredited Naturopathic Medical Colleges (AANMC) accredits naturopathic schools in the United States and Canada. In 2014, it published a report called AANMC Core Competencies of the Graduating Naturopathic Student, which was intended to "guide current and future future programs of naturopathic medical education." Demonstrates knowledge of vaccine administration and maintenance requirement . This list encompasses most of the things that are needed to understand why vaccines are valuable. However, it fails to require that students (a) demonstrate knowledge of the benefits of vaccination, (b) know that the benefits greatly exceed the risks, and (c) recommend the U.S. Centers for Disease Control and Prevention's vaccination schedule that guides the scientific medical community. It is a step in the right direction, but whether and when the naturopathic community will change its behavior remains to be seen. In 2016, the Naturopathic Academy of Primary Care Physicians (NAPCP) published a position paper on immunizations that is 100% in line with the scientific community and includes giving a copy of the CDC schedule for patients or parents to sign . The field of naturopathy has demonstrated a continuous pattern of opposition to immunizations. Some naturopaths who write about the subject are completely negative. Those who present both positive and negative ideas typically emphasize the negative. Its leaders realize that opposition to immunization could damage their credibility when they lobby for passage of licensing laws or other legislative recognition. Those who say they advocate "parental choice" fail to mention the extent to which they and their colleagues portray immunization as unnecessary and dangerous. To be credible, any assertion that naturopaths favor immunization would require further educational reform, a formal change in the AANP position paper and a dramatic shift in the literature emanating from the field. Unless that happens, any such assertion should be considered a dishonest attempt to curry favor with legislators. Lust B (editor). Universal Naturopathic Encyclopedia Directory and Buyer's Guide. Yearbook of Drugless Therapy for 1918-19, Volume I. Published by Benedict Lust, Butler, NJ, 1918, page 15. Harry Riley Spitler. Basic Naturopathy: A Textbook. American Naturopathic Association, Inc., 1948). pp. 214, 271. Quoted in HEW Report on Naturopathy (1968). Pizzorno JE Jr, Murray MT, editors. Textbook of Natural Medicine, 4th Edition. St. Louis, Churchill Livingstone, 2013. Pizzorno J. Total Wellness: Improve Your Health by Understanding the Body's Healing Systems. Rocklin, CA: Prima Publishing, 1996, pp 55-57. Murray MT, Pizzorno JE Jr. Encyclopedia of Natural Medicine. Prima Publishing, Rocklin, CA, 1990. Murray MT, Pizzorno JE Jr. Encyclopedia of Natural Medicine, 2nd Edition. Prima Publishing, Rocklin, CA, 1998. Murray MT, Pizzorno JE Jr. Encyclopedia of Natural Medicine, 3rd Edition. ATRIA Paperback, New York, NY, 2012. Vaccines and asthma or allergies: Do vaccines cause asthma or allergies? Children's Hospital of Philadelphia Web site, accessed April 21, 2019. D'Adamo PJ. The vaccination conundrum. Journal of Naturopathic Medicine 5(1):4, 1994. Wilde, G. Vaccine production and contamination as contributing etiologic factors in neoplastic disease. Journal of Naturopathic Medicine 5(1):6-16 1994. Miller NZ. Vaccines and natural health. Journal of Naturopathic Medicine 5(1):32-39, 1994. Milliman, WB. Childhood immunity. Journal of Naturopathic Medicine 5(1):44-49, 1994. Traub M. Homeopathic prophylaxis. Journal of Naturopathic Medicine 5(1):50-60, 1994. Barrett S. Homeopathy: The ultimate fake. Quackwatch, updated Aug 23, 2016. Barrett S. Comments in the AANP position paper on immunizations. Quackwatch, April 15, 2019. Barrett S. Naturopathic nonsense about immunization: A response to Jim Sensenig, N.D. Naturowatch, April 21, 2019. Wilson K and others. A survey of attitudes towards paediatric vaccinations amongst Canadian naturopathic students. Vaccine 22:329-334, 2004. Downey L and others. Pediatric vaccination and vaccine-preventable disease acquisition: Associations with care by complementary and alternative medicine providers. Maternal and Child Health Journal, 14:922-930, 2010. Busse J. and others. Parents' experiences discussing pediatric vaccination with healthcare providers: A survey of Canadian naturopathic patients. PLoS ONE, 6(8), e22737, 2011. Whitman KB. Childhood vaccine perceptions and practices among naturopathic physicians. Graduate dissertation, University of Vermont, 2016. Hermes BM. Key legislative points pertaining to the licensing and regulation of practitioners of naturopathic medicine in North America. February 2017. Hermes BM. Naturopathic practice without vaccines is not primary care medicine. Naturopathic Diaries, Aug 27, 2015. AANMC Core Competencies of the Graduating Naturopathic Student. Amended March 18, 2018. Naturopathic Academy of Primary Care Physicians position paper on immunizations. 2017. This article was revised on April 21, 2019.